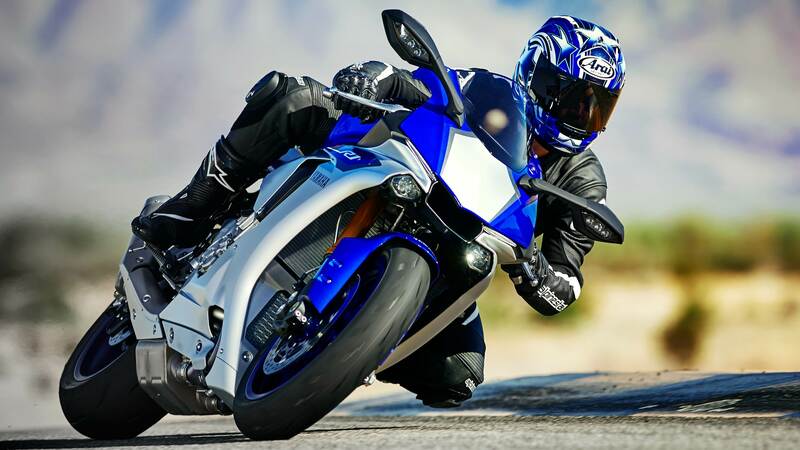 It was seventeen years ago that Yamaha unveiled the original YZF-R1 in the city of Milan. Light, powerful and agile, the R1 offered a whole new level of performance to the supersport rider. And in one brief moment the world of motorcycling was changed forever. History has a habit of repeating itself. Now, two decades on from the arrival of the machine that transformed the bike world, Yamaha raises the bar once again with the release of its next generation superbike! The New YZF-R1. Everything is different, except the name. Right from the beginning of the project it was agreed that this totally new high performance pure sport motorcycle would be developed from scratch without any restrictions. This gave Yamaha engineers and designers the opportunity to explore new concepts and designs, and create the kind of machine that, up to now, only factory riders could ever experience. The team has been able to create a fundamentally different motorcycle that offers overwhelming performance with ultimate control. Built without compromise, the new R1 is ready to transform the bike world and showcase Yamaha’s vision for the future. The new R1’s DNA remains the same as it ever was, but its purpose and design philosophy are entirely different. Featuring sophisticated MotoGP-derived technology, this new machine is a purely focused sport bike that has been developed primarily for the racetrack. A compact and new inline 4-cylinder 4-valve cross-plane engine develops 200 PS without the use of ram air induction, and delivers a strong pulse of linear torque for outstanding running performance – while the new short wheelbase chassis benefits from weight reducing features such as a magnesium subframe and magnesium wheels in order to achieve a wet weight of only 199kg – with a dry weight of 179kg. In isolation, these highly impressive figures of 200PS and 199kg (wet) show the outstanding racetrack potential of the new R1, but it is the widespread use of advanced electronic control technology that genuinely underlines the R1’s positioning as the next generation superbike. The application of cutting edge MotoGP-derived electronic control technology represents a major leap forward in superbike design, and sets the new YZF-R1 apart from its peers. By monitoring every byte of data coming in from multiple sensors in the engine and chassis, the new R1’s advanced electronics enable riders to achieve the very highest levels of engine and chassis control. Featuring the first ever 6-axis Inertial Measurement Unit (IMU) ever featured on a street-legal machine, the new R1 represents the dawning of a new digital era where all riders can experience total 3D control. Fully equipped with banking sensitive Traction Control, as well as Slide Control, Front Lift Control, Quick shifter, Launch Control, ABS and a Unified Brake System – and much more – the next generation R1 introduces racers and track day riders to a new era of rider-adaptive performance. For the first time, all riders are given the opportunity to get a taste of MotoGP winning YZR-M1 technology – as enjoyed by Factory Riders Valentino Rossi and Jorge Lorenzo. To underline just how different this new 200 PS power plant is to its predecessor, not only does it have a different bore x stroke, compression ratio, cylinders, cylinder head and fuel injection system – it also utilizes a completely new cross plane crankshaft design. The only thing that the next generation R1 engine shares in common with the current model is its name! By using aerodynamic analysis to create a more efficient shape, Yamaha’s designers have succeeded in producing a cowl and screen that deliver a reduction of 8% in wind resistance. Not by chance, its central air intake and high windscreen have a strong resemblance to the YZR-M1, and its high aerodynamic efficiency helps to deliver lower lap times on the circuit. In a further move to achieve a low overall weight, Yamaha’s designers have chosen to equip the new R1 with LED headlights and LED position lights. As well as being light and compact, LED lights deliver high luminosity while also requiring a low wattage. The two new small diameter LED headlights are positioned on either side of the central air intake, and are located much lower than on other supersport models – and because of their compact design they appear to be virtually hidden in the new front cowl, giving the R1 a unique ‘face’ that expresses its racing pedigree. One other striking feature is the use of linear position lights that are located within the front cowl. The narrow and straight lines of these twin LED position lights come on when the ignition is activated, and they give the R1 a truly unique frontal expression. When the ignition is turned off, the LED position lights gradually lose their luminosity. Racers who are looking for winning performance – as well as those advanced riders who demand the ultimate track day machine – constitute a significant part of the new R1’s target market. With this in mind, Yamaha have once again looked to the YZR-M1 and developed a new race-specification seat with a wide rear section and angled sides that gives freedom of movement when braking or weight shifting for corners. The seat design has been developed in conjunction with the new aluminium tank whose deep knee recesses allow the competitive rider to adopt a compact and active racing position that gives a heightened feeling of rider-machine unity. Fitted as standard equipment on the YZF-R1M, the Communication Control Unit (CCU) is a user-friendly interface with a comprehensive data logging function that allows riders to record a wide range of running data, including lap times, speed, throttle position, GPS tracking, lean angle and more. Data can be viewed, compared and shared on a tablet using a wireless connection with the R1’s CCU, enabling riders to analyze the previous race or track session and make any necessary adjustments. Riders can also use the CCU as a means of communicating with the Yamaha Ride Control (YRC) system and viewing, downloading or changing the running mode settings. By using a downloadable Android (4.2 on) app, the YRC settings can be amended wirelessly, allowing R1M riders to make quick and easy from a menu of factory or custom settings.